But for now, let’s get into the review! It! 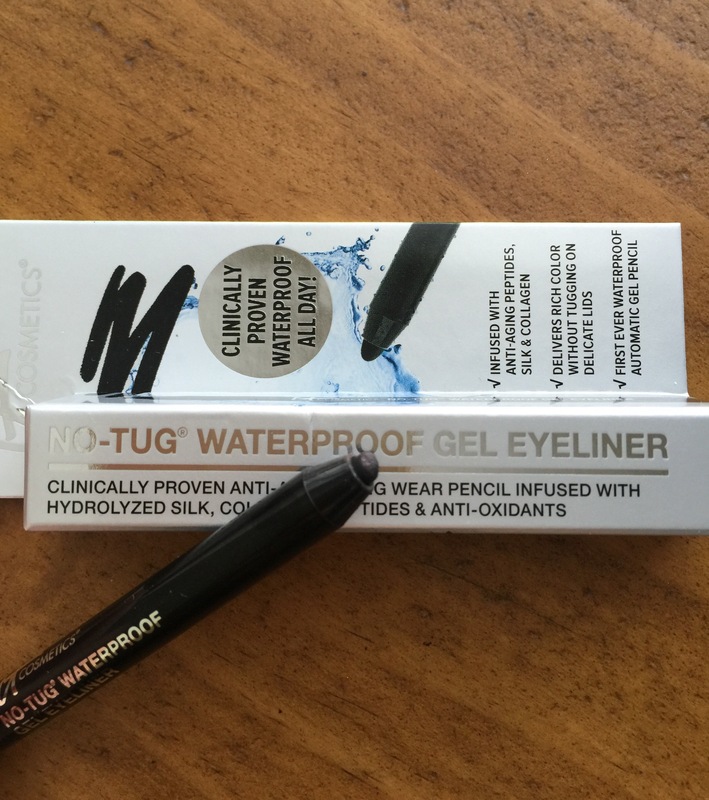 Cosmetics No-Tug Waterproof Gel Eyeliner: I was so excited about this product, as I’ve heard great things about the It! Cosmetics line and I feel like I’ve even heard people rave about this particular eyeliner. Unfortunately, it was a dud for me. While I like a gel liner, this one was almost too soft, too creamy, too hard to work with. It did glide on my eyelid well, but when I tried to flick it out at the end (not create a wing, just flick it upward to keep my eyes from looking downturned) it skipped, smeared, and made a mess. And since it’s waterproof, it was so hard to get off. (Note to self: Test makeup remover pens next.) It may be that it’s supposed to imitate the look of a potted gel liner but in pencil form, but honestly I feel like if I wanted that look, I’d have more control over a pot of liner and an angled brush. That would also give a finer and more precise line, especially at the outer corner–this one became rounded at the tip and I couldn’t change the width of the line. I’ve come to realize that I prefer pencil liners–the kind that can be sharpened–for this reason: I can always get a nice, precise point. Now that I think about it, in my entire collection, I only own maybe three automatic (twist-up) eyeliners. I guess I’ve discovered a pattern. If I’m looking for a good waterproof glide-on eyeliner pencil, I’ll choose the NYX Slide On Liners any day. They don’t smudge, smear, they are easy to work with, and the color selection is amazing. Since they are pencils, you can sharpen them for a finer tip. If you don’t already own the Slide On Liner in Golden Bronze, go out and buy it now. It is my favorite liner for the summer and into the fall, hands down–not too shiny or coppery for work, but adds a glow and warmth to any look. So the It! Cosmetics liner is a no for me, especially at $22, but a great alternative is the NYX. The next product was one I was convinced I wouldn’t like. First, it was a facial cleanser, and I have enough sample sizes of cleansers to last me a year. Second, it smelled like rose–not my favorite, although I am coming around. Finally, I’m just not that picky about facial cleansers. As long as it takes off my makeup and doesn’t dry out my skin, I’m good. I don’t see the need for an expensive version. This one, however, made me reconsider. The rose scent is very delicate and actually quite calming, especially right before bed. It is the first cleanser I’ve used that not only left my skin feeling soft, but also plumper and more hydrated, as if I’d already put on moisturizer. 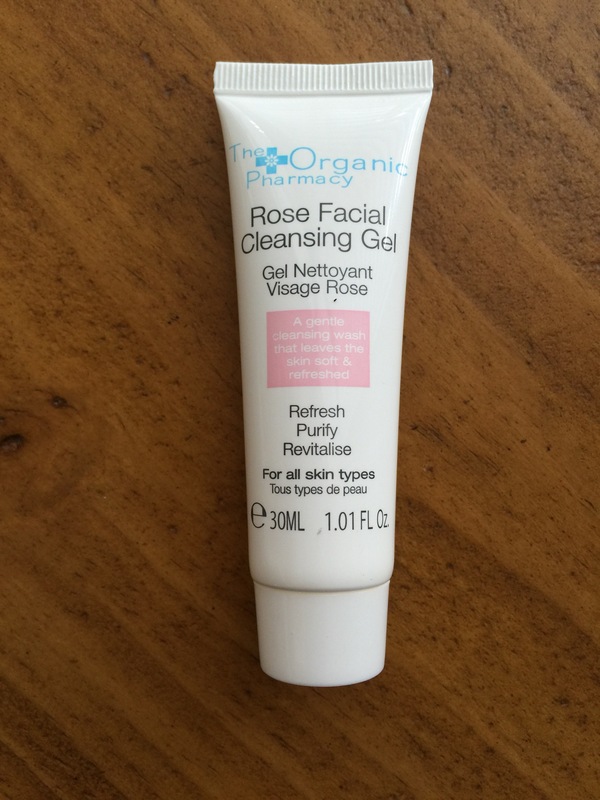 I just loved using it, and normally I just endure my nighttime skincare routine. I guess I shouldn’t be that surprised–The Organic Pharmacy also makes my favorite nighttime lip treatment, the Antioxidant Lip Balm.I really should rename this company “The Brand That Makes Me Want Expensive Versions of Products I Said I’d Never Buy in High End.” I mean really, out of all the cool makeup I receive, a cleanser and a lip balm are things I want to pay over $20 for? But they just work, and better than any others I’ve tried. But here’s the thing: On the Organic Pharmacy website, a full bottle of this cleanser (100 mL) retails for $85. If I’m going to spend that much on a skincare product, I’d probably choose to spend it on something that stays on my skin–a moisturizer or skin treatment–rather than a cleanser, which I just rinse off. I just have a hard time believing that a cleanser can provide enough benefits to make it worth such a high price tag. So while I like this cleanser, I would be unlikely to purchase it due to the high price alone. But I am highly likely to buy the lip balm. 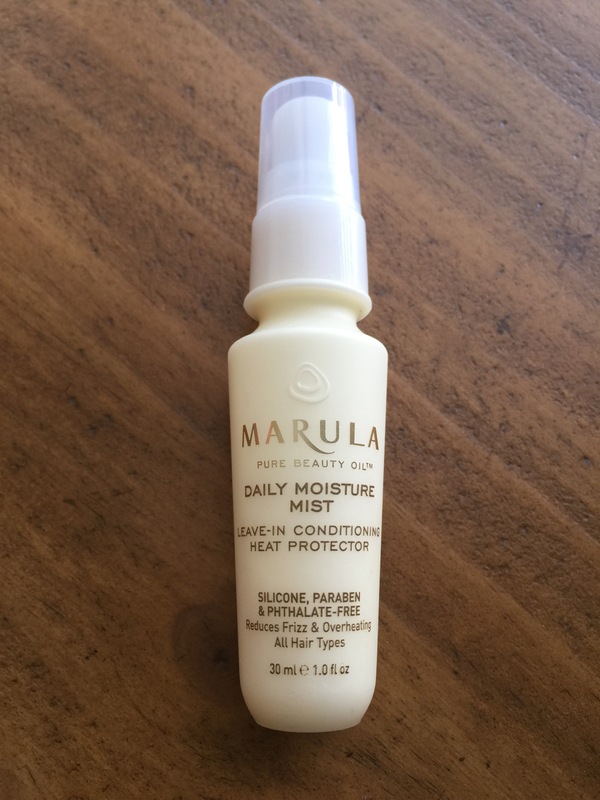 I also received yet another hair oil/leave-in conditioner spray, the Marula Daily Moisture Mist Leave-In Conditioner Heat Protectant. I probably shouldn’t sound so annoyed–I do actually love this type of product, as my hair is somewhat dry and I’m always looking for products that can make it softer and more manageable. And because I typically shower at night and let my hair air dry (this has done wonders for its texture, even though I initially began to do this as a time-saving measure in the mornings), I love testing products that will work as overnight leave-ins to help combat frizz and allow me to style my hair easily in the mornings. The first time I used this product was actually a rare occasion when I showered in the morning; I applied this spray before blow-drying and straightening my hair, something I do maybe once a month. I was immediately struck by the scent. It is somehow both nostalgic and off-putting. I can’t pinpoint the smell exactly, but I immediately thought “1980s hair salon.” As a child of the 80’s, this was a strong association for me–it’s that highly perfumed, stops just short of being truly offensive, scent that smells expensive, but somehow not in a good way. I hope that makes sense. It doesn’t smell terrible, but it’s not the fresh scent I like from a hair product. It did work well: It smoothed my hair and made it soft and manageable but not flat, which is really all I can ask from a leave-in spray. I just don’t think the Marula spray works better than my It’s a 10 Miracle Leave-In Plus Keratin, or my Brigeo Rosarco Milk Reparative Leave-In Conditioning Spray. Since both of my standards retail for $20, and the Marula spray is $33 (granted, for 6.7 oz while the others are 4-5 oz), I will be unlikely to purchase a full size. The scent just doesn’t appeal to me, and in the end, it comes down to that. I received a Winky Lux Diamond Powder. This one is admittedly difficult to review, since I received the shade Light but my skin is tan right now and the powder does not match. The website says that it contains crushed diamonds that are intended to blur imperfections and brighten the skin. I cannot tell if it is meant to be a powder foundation or a setting powder that provides some coverage, but the reviews suggest that people use it both ways. I did give it a try as an undereye setting powder, an area of my face where I did want some added brightness, and it performed nicely. It covered well, smoothed my undereyes, was not overly drying, and did not contain any visible glitter, something I worry about with “blurring” products. But I wasn’t blown away. I mean, I was already kind of annoyed with this bag, as a “Live Your Fantasy” theme doesn’t really scream setting powder, but this isn’t the powder’s fault. 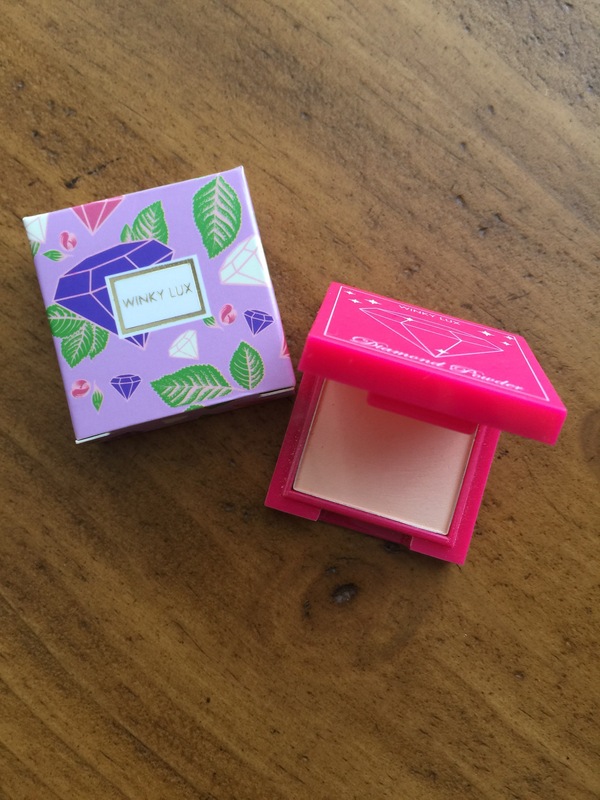 For $20, it performs well, and if you’re looking for a good setting powder, this might work well for you, as it is slightly higher in price than most drugstore powders but definitely less than high end. I likely won’t purchase a full size, because I have setting powders that already work for me. But I will try to give it a fair shot when my skin returns to its normal fair tone. And finally, I received what appears to be a full-sized nail polish by Ciate London in the shade Spinning Teacups. I fell in love with the name alone. 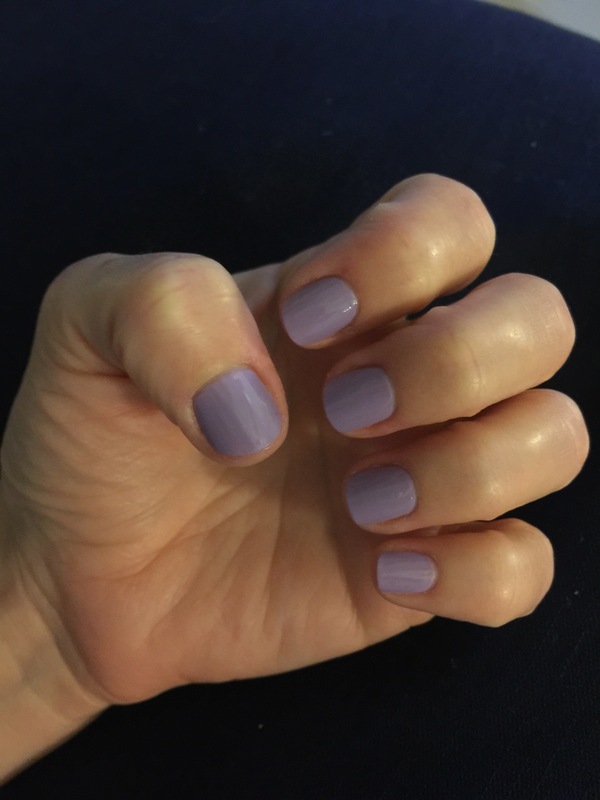 This product has really mixed reviews on Sephora’s website, that ranged from “chipped instantly” to “really long-wearing.” Because I am so hard on nail polish, I will admit I was a little concerned–even polishes that receive rave reviews tend to chip quickly on me, so I wasn’t sure what to think. But I tried this Ciate polish one evening with no base coat or topcoat, and it was gorgeous. 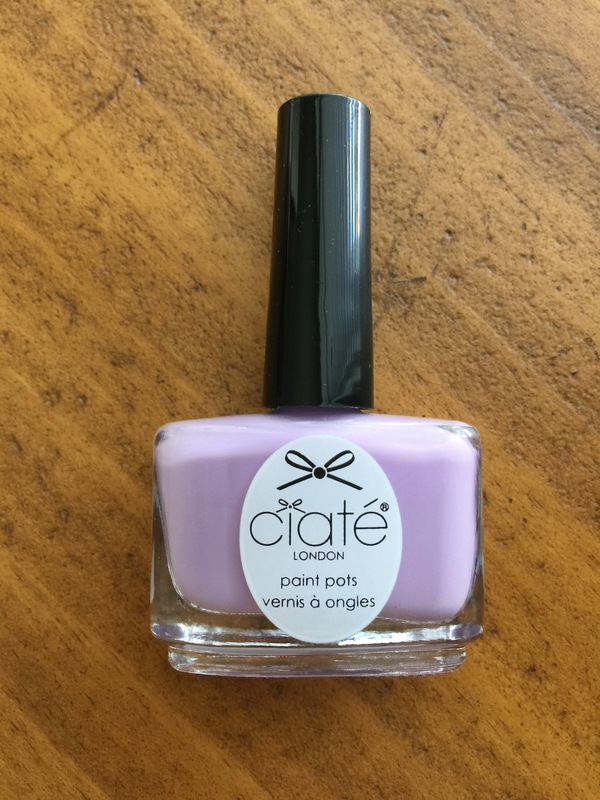 It is an odd formula–a little thinner and more rubbery than most other polishes. It dries down very quickly, though, so that is a plus. The only problem is that it took me three coats to get it opaque; with two coats (my usual application method) it was still a little streaky. I’ve included photos below: the first is my nails with two coats, and then beneath it, my nails with three coats. I know three coats might sound time consuming, but honestly because this polish dried faster than many others, it didn’t take me any longer to apply three coats of this one than two coats of another. I also skipped topcoat to see how it worked on its own. Verdict: It looked like I used a topcoat, and lasted just as long as any polish does when I use one. In short, it doesn’t need it. This polish lasted three full days on its own without any chipping. This may not sounds like much, but three days for me is like a week and a half for a normal person. Most polish chips on me by day 2. It also maintained a glossy finish, even without topcoat, for the full three days. By the third day, it had barely chipped, and I probably could have kept it on because you really couldn’t tell. But my impulse to pick at nail polish the moment it shows signs of weakness was too strong, and I ended up destroying what probably could have lasted several more days. I think what works for me with this polish as opposed to many others is that is seems like a wetter formula. 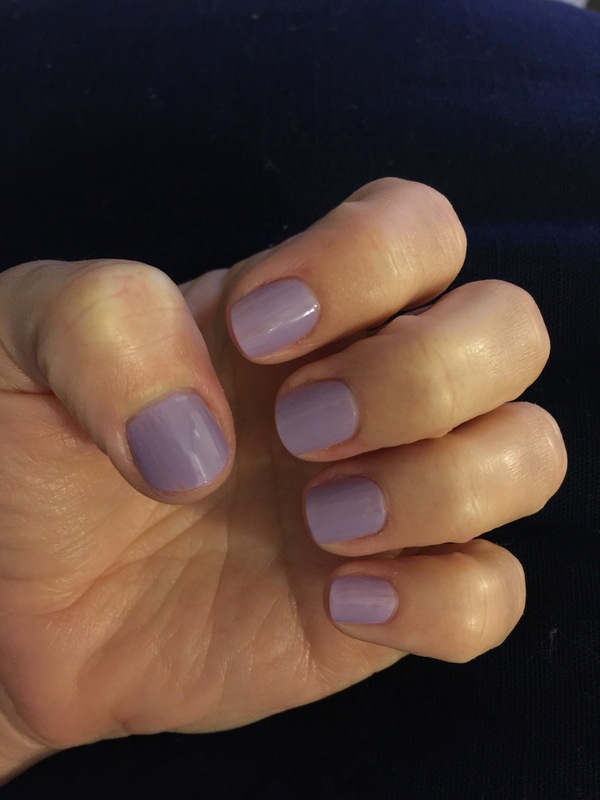 I have very dry nail beds, and polish seems to chip off easily because my nails just dry out. This almost seemed to moisturize my nails and thus was able to stick better. It retails for $9 a bottle at Sephora, so it is in the same price range as OPI and Essie nail polishes. But I actually prefer Ciate over both of these brands. (I know many people love it, but Essie chips on me within a day!) I will definitely be buying more shades of this polish! I’m intrigued to see how some of the darker fall shades perform. Final Word: The nail polish is the only product that I will purchase, and I look forward to trying more shades. The rest of the bag didn’t wow me. 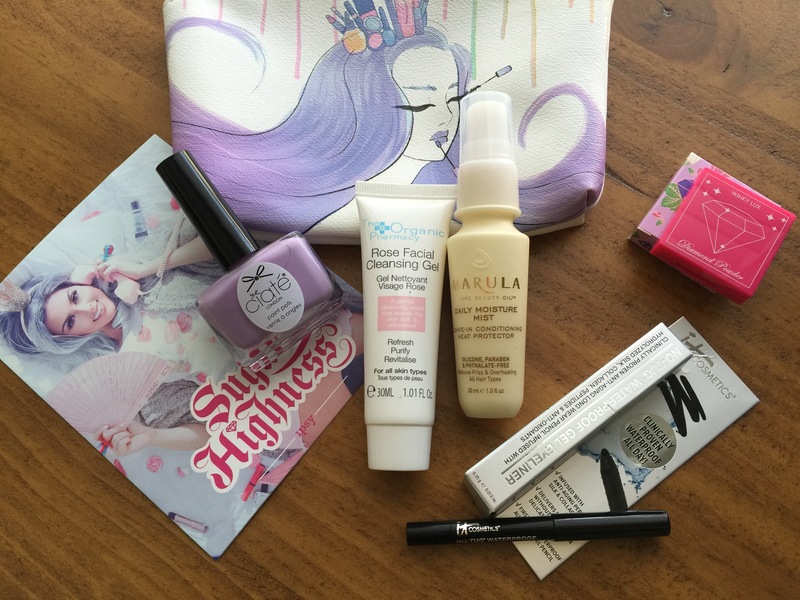 I was happy with all of the products except the eyeliner, but they didn’t blow me away. This bag was just a little *meh* for me. Not bad, just not exciting.